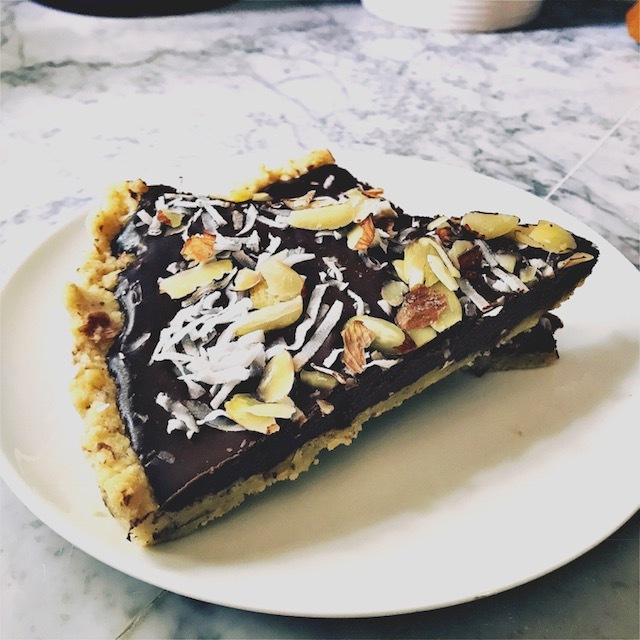 This BEAUTIFUL Chocolate Coconut Almond Tart recipe is an adapted from a recipe by Sally, from Sally’s Baking Addiction. 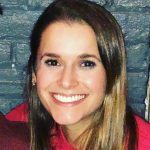 I love Sally’s blog and am inspired by many of her recipes. The term “healthy” is rather confusing. What is healthy? Is it related to the ingredients? The nutrition facts? Different people have different views of what is healthy. Someone who is trying to lose weight might consider a 100-calorie pack healthy, because it is low calorie. However, a paleo person would find a 100-calorie pack unhealthy because it is processed. On the flip-side, a paleo person can eat certain types of meat (bacon) which a person watching calories would not. I hate to use the word healthy for this very reason – because it can mean different things to different people. So what about this dessert? Well, its made with whole ingredients like unsweetened coconut flakes and raw almonds. And it uses almond flour instead of regular flour, so its completely gluten free! Having said that, it uses coconut milk (which is high in fat), maple syrup (high in sugar), and chocolate (well of course there is nothing wrong with chocolate!). So, is this dessert healthy? 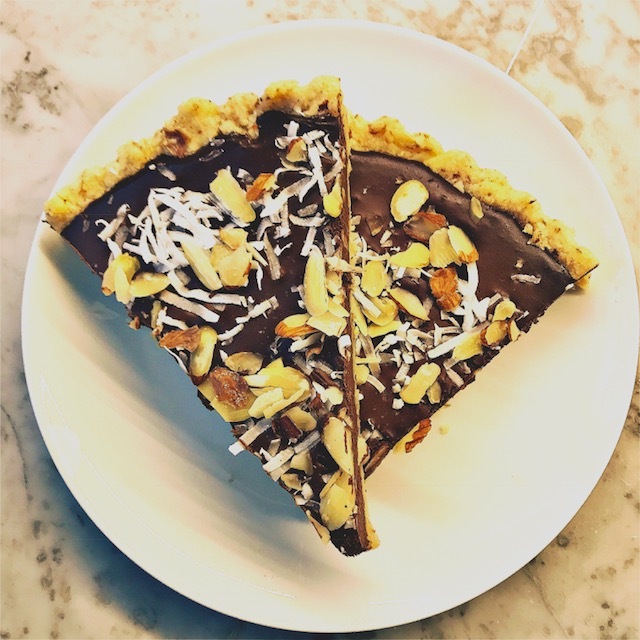 I will let you be the judge of that – but it sure is delicious and a fun change from your traditional tart! 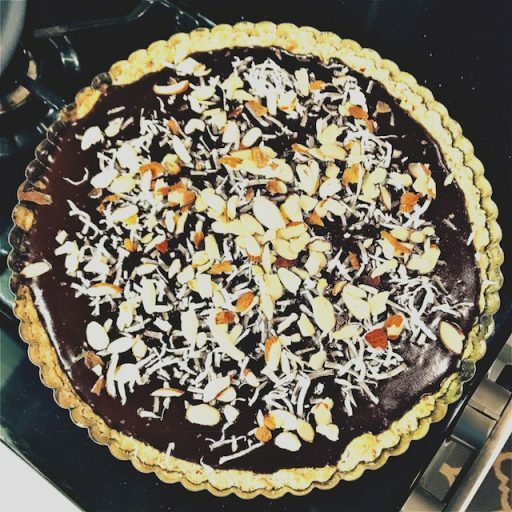 This chocolate tart is absolutely delicious. The chocolate, coconut milk filling becomes light like a mousse yet decadent like a pie. The crust is light and soft, yet not too crumbly. And the toppings – I absolutely love the added coconut and almonds. They add the perfect crunch to “top it all off!” This will definitely be something I make in the future when trying to impress a group! Sally recommends using all bittersweet chocolate in her original recipe, however, I prefer my chocolate a little sweeter – hence, my recommendation for part semi-sweet and part bittersweet chocolate. Feel free to follow your heart and use the chocolate of your choosing! I would just recommend using a baking chocolate like Baker’s or Ghiradelli. In a food processor or small blender (I used my magic bullet! ), combine almonds and almond flour. Pulse until almonds appear mostly ground. Add maple syrup and melted coconut oil to almond mixture – pulse until all mixture is moist. Scoop almond flour mixture into tart pan – spread throughout pan and press firmly down using clean hands (or the bottom of a glass). Mold crust to bottom and sides of tart pan. Bake for 15-18 minutes, or until lightly browned. Remove from oven and allow to cool slightly while preparing filling. For the filling, break up chocolate and place in bowl. Drizzle maple syrup over chocolate. In a small saucepan, heat coconut milk until boiling. Continue to stir coconut milk to prevent burning at the bottom of the pan. Pour coconut milk over chocolate and stir until mixture is smooth and all chocolate is melted. Pour chocolate mixture into tart shell, allow to cool for 5-10 minutes. Sprinkle with sea salt, coconut flakes, and sliced almonds, if desired. Loosely cover and refrigerate for 3-4 hours or overnight. Slice and serve! Storage: Refrigerate for 2-3 days. Looks yummy! I’ll make it this weekend!